Share your photos on Instagram with the hashtags #maritimetop and #lieslandco. Chest 34" 35" 36" 37" 38" 39"
View A Sleeve* 22 1/4" 22 1/2" 22 3/4" 23" 23 1/4" 23 1/2"
Length* 23 1/4" 23 1/2" 23 3/4" 24" 24 1/4" 24 1/2"
Chest 40 1/2" 42" 43 1/2" 45 1/2" 47 1/2"
View A Sleeve* 23 3/4" 24 1/4" 24 1/2" 24 3/4"" 25 1/4"
Length* 24 3/4" 25" 25 1/4" 25 1/2" 25 3/4"
I sew a lot of Indi patterns. 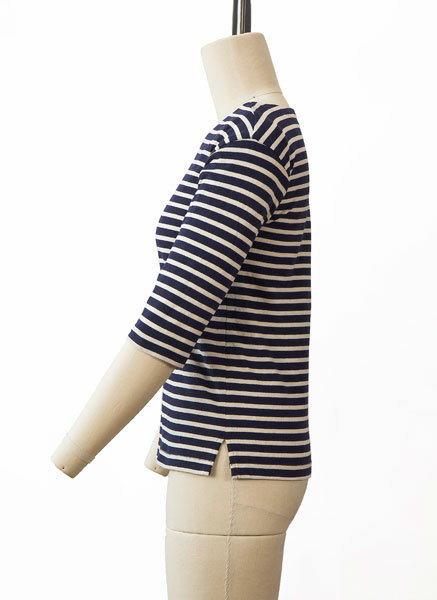 I recently sewed the Maritime top. I made the full bust adjustment. The instructions in Liesl's patterns are so good. 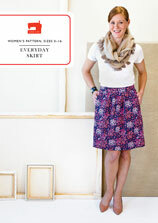 I particularly love the armholes in this pattern. Liesl drafts the best armholes. I love the fit lines of this pattern, and it feels so good wearing. To me, the mark of a good fit is when you feel comfortable all day long in your garments. I love Liesl patterns but could not get the neck to look good on me. It was too wide and just the wrong shape. I am sure it is partly my fault and I need to stay away from that neckline. Perfect pattern. I was worried about the pdf printing and putting together. But no trouble. Easier than cutting that tissue pattern apart. I have made 4 so far. I am a major Liesl fan! 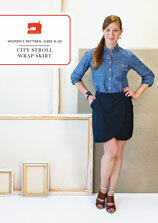 I've made about six everyday skirts, and have a well fitting muslin for the Moto jacket. So I know the care and knowledge that go into these well-drafted patterns. Instructions are really good: I always learn the right way to do things instead of having to wing it. 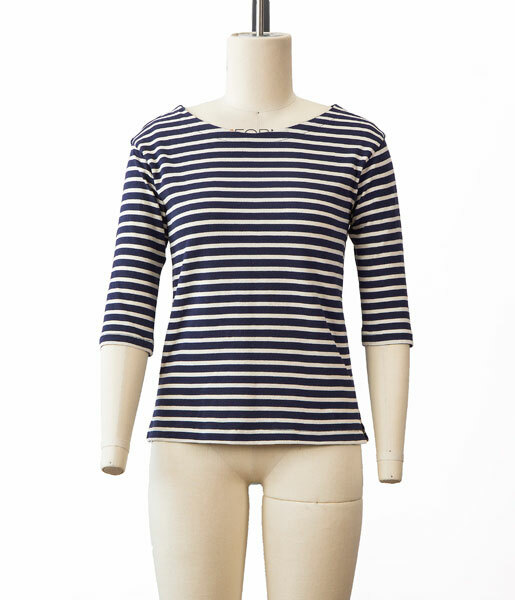 I made the maritime top last week in a sort of beefy 100% cotton knit to check the fit and see if I needed to do an FBA. Which for my next go round, as long as my fabric has some give I think I can do without. I was thrilled with my first top, and wore it to 3 parties over the weekend of 4th! I am a beginner sewer and got up the challenge of working with these new stretchy knits and did a bust adjustment. I was pretty happy with the way it turned out. My Kaufman Laguna jersey print stretched a little at the neckline but I hoping with a wash it will not be noticeable. 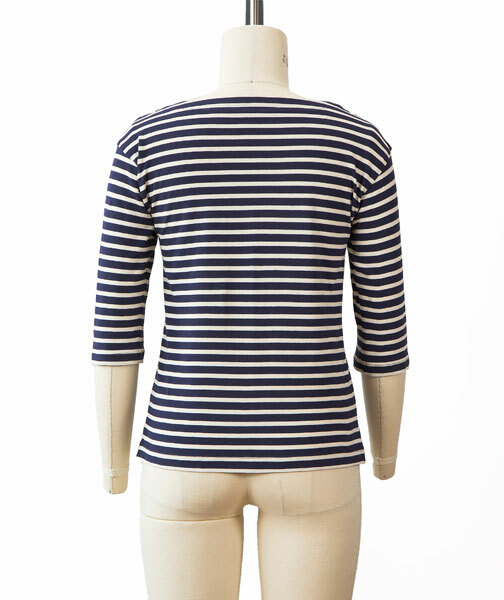 I have broad shoulders so am a little unsure if I need more adjusting and the neckline was a little broader than I am used to but with a scarf which I usually wear, it looks great and is very comfortable. Am going to try a plain Kaufman Laguna jersey next and make the sleeves an inch longer as I think I have longer arms. Very pleased with the pattern. Top was quite easy to make however I chose a very stretchy fabric and the neckline was difficult because it kept curling. Next time, I will chose a fabric with less stretch. Pattern was easy to download and instructions were good. I had a little confusion on the type of stitch to use and it wasn't until nearly the end where I realised that a normal straight stitch would have worked rather than the stretch stitch I was using. Next time, I will try the straight stitch! Other than that, the instructions are as excellent as they were in the Secret Agent pattern and it was a good lesson on sewing knits. I need to make some adjustments to the fit (I made the FBA dart too low, I think) and I think I'll lengthen the body a bit, but it's still a flattering top, according to my husband. It took a littler longer than I anticipated to finish the top, but I was learning and doing my first FBA. Next time will be much speedier! This is a great pattern. Super fit and very well written instructions with great tips even for experienced sewers. I downloaded the pattern and after experimenting with some cheap fabric was able to select the size to print that made the best fit for me. 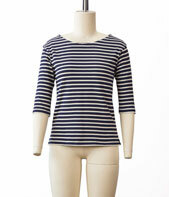 I already had bought the Gallery Tunic & Dress in hard format and was so impressed decided to try the Maritime top. So far I have made three tops and can't wait to receive my Coverlock machine from Janome to make my hemming more authentic. Experimenting with different weights of knits. 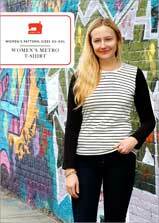 I finished a top in a sheer chartreuse on gray stripe and the fit is comfy and flattering. Fiddled with the neck finishing in a second top with a slightly heavier knit. Instead of a facing, I attached a folded binding. I will probably make a third. I may have made a size too big because it was baggier than normal and the 3/4 sleeves weren't quite where they should be; I will have to shorten them. But great pattern and easy to make! I made this tee shirt and it turned out to be just the way I wanted it to be. It fit nicely and looks good. I printed the A0 file at a local copy shop so can't comment on how this assembles. So nice to have the option to print at a copy shop. I've made three versions of this top in the 3/4 sleeve and I'm happy with all of them. The instructions are very thorough and easy to follow. The neck facing looks extremely professional in comparison to bias bindings etc. I agree with others that this was by far the easiest PDF pattern I have assembled. The directions are well written but I did have to search the pattern in order to find the seam allowance. This pattern produces very professional results. My top fits great! I will make this pattern again. This was by far the best PDF pattern I ever cut and taped together! The signs where to cut are so helpful! The measurements showed my, that the pattern is not made for pear figureds like me, so I graded to a wider size at the hips. However, there is one big mistake I made! I read all the general instructions where there is indicated a seam allowance of 1/4" (speaking of children patterns, in addition). I wondered but sewed it like this. When finished, I noticed that, at another place, the seam allowance is indicated as 1/2"! My knit has a good drape so the wider top is very nice. Next time, I will sew with the SA of 1/2", though. This is the first time I have used a Liesl + Co. Pattern. I have heard great things about these patterns and I was not disappointed. This was by far the easiest PDF pattern I have put together, I love the grid, it really helps line up the pages correctly. The instructions are great, very clear and easy to follow. I like the techniques used on this top, they produce a very nice top that is more than just a basic t-shirt. I know I will get a lot of use out of this pattern! I made up the 3/4 sleeve top in St. James knit and was very happy with the way the top sewed up. It was straight forward and it looks just like the picture. The sizing was true to my measurements.I wear it a lot! Perfect with jeans and capri's. My 2 daughters have asked me to make them the same top in different colors. I highly recommend this pattern, it is a classic. I will sew it again I am sure. In the first printing of the paper version of this pattern, there were two errors in the instructions. Both of these errors have been corrected in the digital version of the pattern that is now available. The second page of the instructions refers to using 1/2" seam allowances when 1/4" seam allowances were our intention. If you’ve used 1/2" seam allowances, the shirt will fit just a little more tightly than intended but the pattern will still work, so don’t worry too much if you’ve sewn them with the 1/2" seam. Related to the first issue, on page 2, step 1 under "Sew the Side Seams and Make the Vents," you’ll get better results at the side seam and vent if you use a 5/8" basting seam and a 1/4" seam. This step should read as follows: "1. Fold the shirt, with right sides together and pin the sleeve edges and side edges together, matching the dots at the side seams, the notches, and the underarm seams. Begin by setting your machine to a basting stitch and, using a 5/8" seam, baste from the bottom edge of the shirt’s hem to the dot, lockstitching or backstitching at the dot (this will temporarily close the vents at the bottom of the shirt); then set your machine back to a regular stitch and continue sewing all the way up the side seam to the edge of the sleeve with a 1/4" seam. Repeat to stitch the other side. 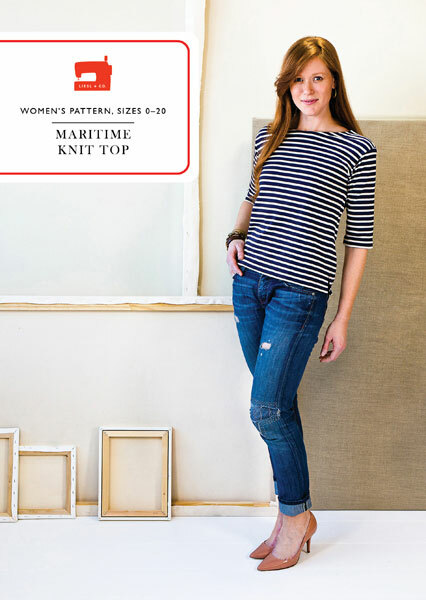 Discussion on the digital maritime knit top sewing pattern from the Oliver + S Discussion Forums. Find and share more photos on Instagram using the hashtags #maritimetop and #lieslandco.